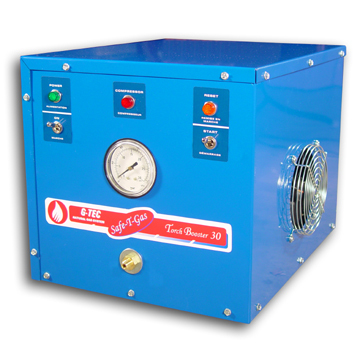 TB-15 and TB-30 Torch Boosters raise gas pressure to 25 psi and provide flow at either 15 cf/hr (15,000 BTU) or 40 cf/hr (40,000 BTU). Both systems are compact and measure 12” by 12” on the front panel and only 16” deep; weight is about 50 lbs. They can be installed “anywhere” indoors without special site preparation. They are quiet and can be placed right in your work area. A Torch Booster is easy to use...just turn it on and get all the gas you need. When your torch is not lit the Torch Booster automatically goes into recirculation mode. They are designed to be left running for short periods when torches are not being used and do not require operator attention as torches are turned on and off. 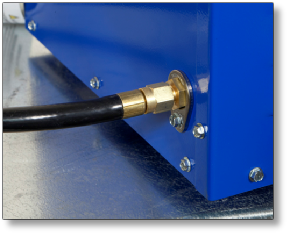 The system includes a flexible 5’ hose for connection to the gas pipe and a shutoff valve. Customers may also purchase a regulator to set gas pressure between 1-25 psi. 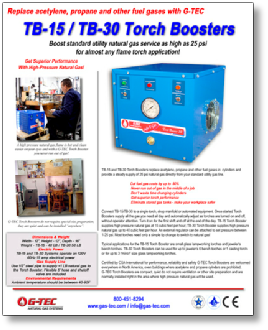 TB-15 and TB-30 Torch Boosters are Certified by CSA International and are permitted in buildings that prohibit gases in cylinders, such as acetylene and propane. 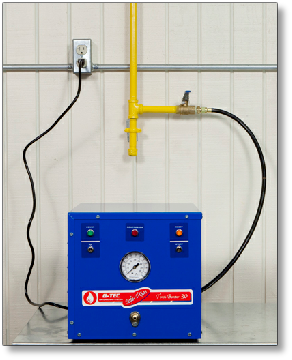 Both Torch Boosters need a gas supply pipe with less than 1 psi pressure and at least 1/2” diameter. Power requirement is 120V 15 amp. 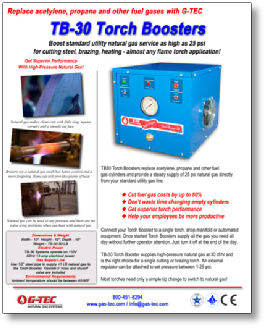 Typical applications for TB-15 Torch Booster include light brazing, glass lampworking and jewelry manufacturing. Click on the YouTube link to see and hear more about TB-15 and TB-30 Torch Boosters. 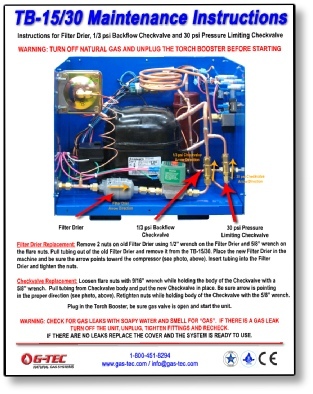 Get an overview of how the Torch Boosters work, how to turn the system on and off, how to install it and safety features. Keeping your Torch Booster in top running condition is simple. Every 2,000 hours change the Filter Drier, Backflow Check Valve and Pressure Limiting Check Valve. Click on the TB-15/30 Maintenance Instructions to the right to download a copy of the instructions for this work or watch the video below. 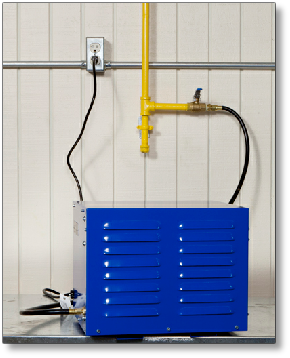 Call G-TEC at 800-451-8294 to order your TB-15 / TB-30 Maintenance Kit! TB-15 and TB-30 Torch Boosters are easy to install. 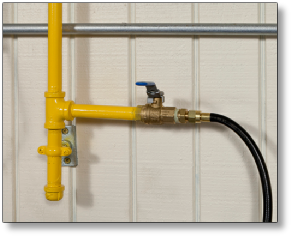 Provide low pressure natural gas in a minimum 1/2” diameter pipe then G-TEC includes a shut-off valve and 5 foot flexible hose. One end screws on to the shut-off valve and the other at the rear of the Booster cabinet. Electric power requirement is standard 120V 15 amp service. How to install TB-15 and TB-30 Torch Boosters.